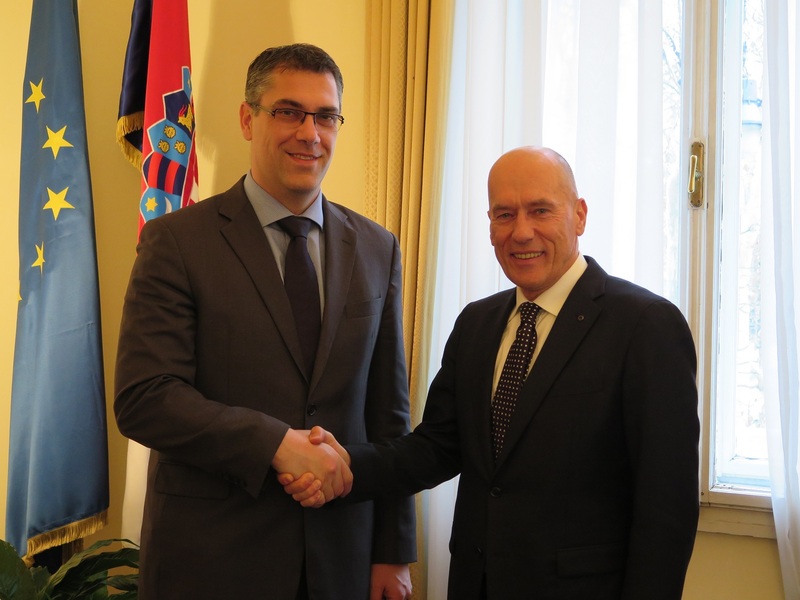 Founder of the Esimit Europa project, Igor Simčič, today at the Ministry of Foreign and European Affairs of the Republic of Croatia met with Hrvoje Marušić, Assistant to the Minister. They talked about this year’s plans of the Esimit Europa project, which will bring an even closer collaboration between the two neighboring countries, while Esimit Europa 2 - one of the world’s fastest and most technologically advanced sailing yachts – will take part at one of the regattas in the Republic of Croatia for the first time during this season. The mission of the Esimit Europa project is connecting diplomacy, business and sports in a unique way – through winning performances of the Esimit Europa 2 yacht, which sails under the European flag, it carries the message of a successful and united Europe around the world. Project is under the patronage of the President of the European Commission, Mr. José Manuel Barroso, the President of the European Parliament, Mr. Martin Schulz, and is supported by the Minister of Foreign Affairs of the Russian Federation, Mr. Sergey V. Lavrov as well as the Minister of Foreign Affairs of the Republic of Croatia, dr. Vesna Pusić. Later on, the Esimit Europa project was also a partner of Croatia’s biggest regatta – Fiumanka and of the European Youth Laser Radial Championship in Split. Following today’s meeting, the collaboration will be further developed and the Esimit Europa 2 yacht will for the first time compete at one of the regattas in the Republic of Croatia during this season. At the occasion of this meeting, Assistant to the Minister of Foreign and European Affairs of the Republic of Croatia, Hrvoje Marušić, said: “The Esimit Europa project connects us on the sea as well as on shore, while it continuously promotes values such as team spirit, solidarity, collaboration and innovativeness. Today, those values are essential, so I am glad that the Esimit Europa 2 yacht with its multinational crew will sail also to Croatia this year.